Rumour had it that the concert was half-sold out before tickets were even released to the school population. Much of the ticket sales went to family and friends of the performers, making Vocal Exploits XXIII as much of an intimate sharing of music, as it was a showcase of the choirs’ vocal mastery and musicianship. It was thus with great anticipation that the audience waited for the concert to begin. Raffles Voices gave a strong opening number with Kungala by Australian composer Stephen Leek. Highly evocative of the Australian plains, with a melodic line sung by the basses reminiscent of the didgeridoo, the piece was an instant personal favourite. With much prancing around the SOTA stage and stamping, the piece set the tone for the rest of the night as Raffles Voices proved both their musicianship and choreographing abilities. This was followed by Solfeggio, an aleatorical piece playing with register, and dynamics, resulting in chilling timbres and harmonic colours. A short atmospheric piece, it left the audience perhaps a little confused, but nevertheless satisfied. Danny Boy, a classic Irish ballad arranged by Joseph Flummerfelt, was handled with much care and loving tenderness. Special attention paid to the words made it extremely heartwarming and intimate. The animated rendition of the Beatles’ hit, Penny Lane, arranged by Peter Gritton, proved that choir concerts are not always unrelatable and detached from the audience. The chemistry between choir and conductor was undeniable, ending the excellent segment by Raffles Voices on a high note. Raffles Chorale was represented by the Year 5 batch, but their size did not matter in a segment that was full of heart. The segment opened with Kentaro Sato’s Mae-e, a beautiful song of hope for Japan in the aftermath of the 2011 disaster, executed with little difficulty. For Yang Sinyee, it was a personal favourite because of “the meaning behind it, and that [the Japanese] can make such beautiful music out of tragedy.” For the choral music fanatics out there, a little research post-concert showed that the score is available online for free. Arranged by the conductor, Mr Toh Ban Sheng, Lok Sui Tien is a Hakka folksong about rain. With a stunning opening, reminiscent of the skies clearing after the rain and the sun shining through, the piece held the audience’s attention throughout. Clean glissandos and excellent dynamic control marked the work song, filled with brilliant harmonies, dazzling to the very end. The world premiere of Los Espejos was no less captivating. Percussive and demanding in terms of vocal agility required, Raffles Chorale pulled it off without difficulty. The bright, clear solo bursting through the layers of colour and harmony by Tiara Valencia Sadikin was the icing on the cake. Nota by Jan Bark was a daring choice, challenging both the audience’s perceptions of conventional choral music, and the choir’s spontaneity. The raw quality of soloist Ma Yuqing’s folk singing recalled the vast Mongolian plains. Much of the music had to do with movement and formations, which brought out different aural effects as well as visual stimulation. Chorale member Gladys Yeo remarked, “Every rehearsal was very different for this piece, due to its spontaneous nature. We had to react and think on the spot, so it was not a piece that we practiced over and over again to get the details right, unlike the other pieces in our repertoire.” Nevertheless, it was refreshing to listen and watch. With A Little Help From My Friends, arranged by Peter Gritton, was short and sweet, with confident solos and cute choreography from Lau Rui Joong, Bryan Ang, Andrew Yap, and Raoul Muttom. 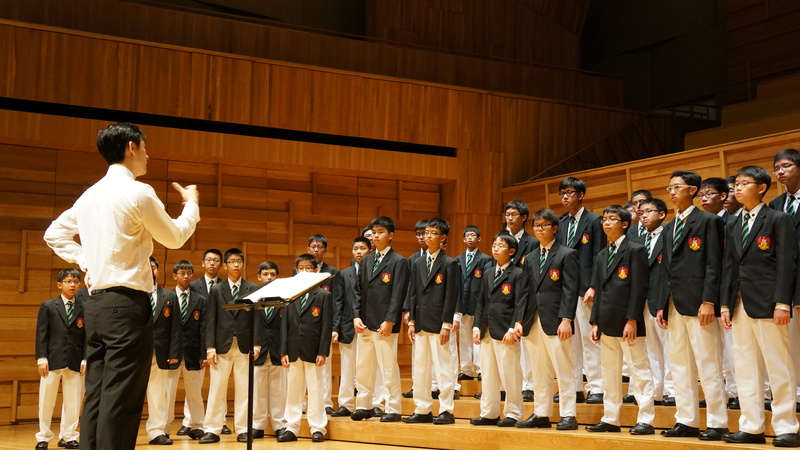 The third segment of the concert saw the alumni of the Raffles choirs come together. Their respect for Mr Toh clearly had not waned as they looked to him for their visual cues. Raffles Singers delivered an overall solid performance, with Dziedot Dzimu’s soaring melodic lines and rich harmonies encapsulating the yearning for freedom in Soviet Russia. Le Baylere was lyrical and romantic, typical of French song, and proved a breeze for the seasoned singers. Pekka Kostiainen’s Jaakobin Isot Pojat was technically challenging, requiring great control and chemistry among the singers, as well as a keen ear. The Raffles Singers pulled it off, demonstrating once again the maturity of the choir. All three choirs gathered on stage once again to deliver the final segment of the programme. Ametsetan, a song of celebration written by Javier Busto, was no doubt one of the grander pieces in the repertoire. The exquisitely angelic four-part women’s chorus, followed by a waltz replete with choreography, marked it as one of the high points in the concert. Mere words fail to do justice to the last song on the programme. The Long Road is a Latvian love poem set to music by Eriks Ešenvalds. Deeply haunting in its beauty, intense in its subtlety, it encapsulates the yearning and tenderness of lost love all into one. Two recorder solos and two ocarina solos soared above the sustained harmonies, calling to mind the vast distance between the two lovers. Mellifluous melodies sung by the descants, and interlocking textures brought the piece to a heart-wrenching climax, before bringing the piece to a bittersweet close. This piece was definitely the highlight of the night, and several audience members could be seen brushing away their tears discretely. Of course, no concert involving the Raffles choirs would ever be complete without the Institution Anthem. Tradition dictates that the Anthem has to be sung as the encore, and the combined choir did so that night. 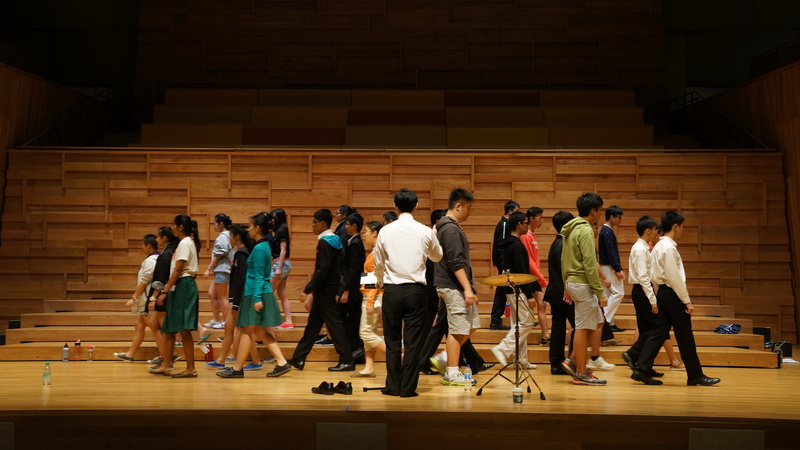 Rafflesians around the concert hall arose and joined the choir in voice, reminding the audience once again that this was not just a virtuosic showcase, but a sharing of music before the term drew to a close. My only real gripe of the night, however, was the audience member next to me who had a severe lack of concert etiquette, marring the concert experience for those around him. Inappropriate comments were made at inappropriate times; catcalls given when only enthusiastic applause was required, and even the glares directed at him did not deter his behaviour. Not everyone in the audience wants to know your friend’s name, neither do they want to hear about how boring the programme was when it was perfectly delightful. A pertinent reminder, therefore, to future concert- goers: be mindful of your etiquette, even in your enthusiastic showing of support for your friends. But personal gripes aside. All in all, Vocal Exploits XXIII was an amazing experience for both performers and audience alike, and was definitely a Saturday night well-spent. This reviewer looks forward to Vocal Delights at the end of the year!